Images of oil-coated seabirds after oil spills are a stark reminder of the massive damage that ship wrecks can do. Find out what WWF is doing! Oil spills have huge and immediate economic, social, and environmental impacts. Local people lose their livelihoods as fisheries and tourism areas are temporarily closed; the clean up costs are enormous; and tens of thousands of marine animals and plants are killed or harmed. And the damage goes on. The chemicals used to break up the oil can be toxic, and it's impossible to remove all the spilled oil. Even after an area has been cleaned up, it can take a decade or more to fully recover. There's also the problem of the oil that goes down with the ship, which can contaminate the seabed and marine organisms. This oil can also resurface. In 2001, a cyclone off the island of Yap in Micronesia disturbed the oil tanker USS Mississinewa, which was sunk during World War II. For two months, thousands of litres of oil and gasoline leaked out of the rusted ship wreck onto the beaches of the atoll, stopping the 700 islanders from fishing. There are hundreds of other shipwrecked tankers around the world. 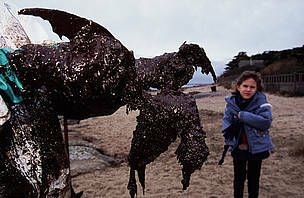 Water birds covered in oil are a common sight in the aftermath of an oil spill. In this case a volunteer holds a dead Common guillemot covered in oil from the 'Erika' oil spill. The 'Erika' broke in half in rough seas around 70km off the northwest coast of France on 12 December 1999. The 24-year old tanker lost an estimated 10,000 tons of oil into the sea which washed up onto a 400km stretch of the French coastline. Recent studies have concluded that it is more humane to euthanise the birds rather than clean them. After the 'Prestige' oil spill in Spain that killed around 250,000 birds, even the thousands that were cleaned still died.